Falcons are majestic creatures and cunning hunters. Known for their exceptional speed among the many birds of prey, all falcons share a similar diet and hunting techniques. The scientific name falco is Latin for hook-shaped and may refer to their talons or the beak. Of the many species of falcons, the peregrine falcon is the most commonly known. The prairie falcon, aplomado falcon, red-footed falcon, collared-forest falcon and gyrfalcon are also part of the large falcon family. There are 13 species of kestrels as well, and along with the Merlin, they make up the smallest members of these raptors. Falcons, particularly peregrines, live on a diet that mainly consists of smaller birds, according to Defenders of Wildlife. They hunt pigeons, blackbirds, jays, starlings and waterfowl. Occasionally they will feed on small mammals like ground squirrels, mice, rats and gophers. They also eat bats, lizards, small snakes and frogs and insects. The USDA Wildlife Habitat Management Institute reports that the smaller species of falcons, such as kestrels, actually prefer to eat a large portion of insects like grasshoppers, crickets, moths and beetles. During the winter months, kestrels must eat small mammals and small birds because of the lack of insects. Kestrels must eat about 21 percent of their body weight per day. With a general weight range between 3.5 to 5.3 ounces, this doesn’t sound like much food, but it is appropriate to the species' small size. Female raptors are usually larger than males. The bigger species like peregrines eat approximately 70 grams of food a day, which equates to about the size of two blackbirds. Falcons will migrate throughout the year to where their food source is in the greatest abundance. Some will move vast distances, traveling from as far north as Alaska all the way down to South America, for example. They are usually found in open areas. Peregrine falcons favor habitats that are near sources of water, but can be found in mountainous regions, particularly during their breeding season. They are also considered the second most globally widespread of all the raptors, with habitats on every continent except Antarctica, according to the Peregrine Fund. Like other predators, Falcons have to hunt for their food. 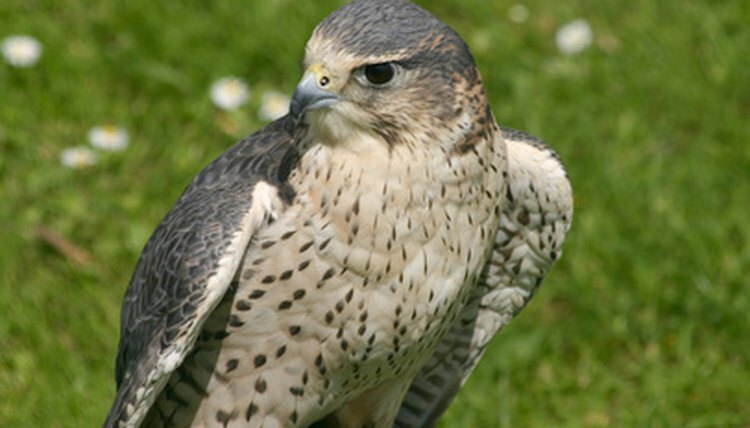 Noted for their remarkable speed, falcons utilize this trait to be highly effective hunters. The Peregrine falcon is the fasted bird in the world, according to the Seattle Audubon Society. They are aerial hunters with very keen eyesight, being able to see their prey up to a mile away. They swoop down at speeds that can reach 200 miles an hour and catch their prey mid-air, usually killing it instantly. Kestrels use a similar technique, hovering in the air and diving down on their prey once it has been spotted.